Is China building a harmonious world? In order to answer this question, it is necessary go beyond simply reviewing the official narrative of the 'harmonious world' policy and instead consider it in relation to China's international and domestic actions. Moreover, the views of China's 'unofficial' actors are crucial in understanding its so-called 'harmonious' approach to diplomacy and foreign policy. By looking beyond the 'international bubble,' this paper aims to consider the 'harmonious world' policy anew and show the multiple, and often conflicting, future world orders and strategies that may arise as a consequence of the policy's implementation. The analysis concludes with a brief insight into what the future may hold for China's harmonious vision of world order, emphasizing that listening to ideas beyond the official lens will be more important than ever. What is the "Harmonious World"? UN reform to improve efficacy and maintain authority. Almost unanimously, theorists, academics, and policy makers around the world agree that China is 'rising' (regardless of the negative/positive connotations associated with the term 'rise' itself). In 2007, the same year the 'harmonious world' policy discussed herein was further institutionalised in Hu's official "Report to the 17th Party Congress," China was the world's third largest trading partner with a GDP of $3.24 trillion dollars, and has since become the second largest, overtaking Japan (Jintao 2007; Bergsten et al 2009, pp. 209-210). Even during the recession, China was able to boast growth rates unlike any country in the world (Feldkircher and Korhonen 2012, p. 04). It has therefore become of primary importance internationally to ask "what does China want?" and "what will China do?" with its newfound global and rising economic power, which is sure enough being translated into soft/hard power and growing political influence in major international organisations, such as the UN Security Council and the World Trade Organisation. Consequently, the emergence of the foreign policy concept of the 'harmonious world' in the mid-2000s grabbed the attention of 'China-watchers' worldwide who are concerned with China's role in international politics. So what then is this 'harmonious world' (hexie shijie) perspective? A great place to start our analysis therefore begins with an evaluation of official discourse itself. Heralded as China's official foreign policy strategy, 'harmonious world' first rose to prominence internationally in 2005, during a keynote speech made by Hu Jintao at the UN's 60th Anniversary Summit (Jintao 2005). In this speech, Hu outlined a four-point proposal advocating (1) multilateralism for common security; (2) win-win co-operation for common prosperity; (3) inclusiveness for the coexistence of all civilizations and finally (4) UN reform, to improve efficacy and maintain authority (Jintao 2005 pp. 04-09; Dellios 2009, pp. 09-11). The details of this foreign policy approach were further reinforced in a white paper entitled "China's Peaceful Development Road" in the same year, and again reiterated in Hu's speech to the 17th National Congress of the CCP in November 2007 (Ding 2008, p. 109). 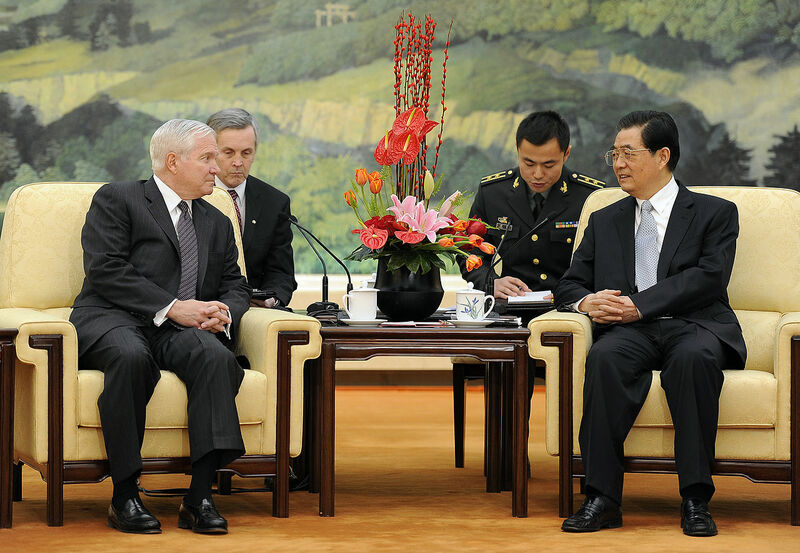 President Hu Jintao and U.S. Secretary of Defense Robert Gates at the Hall of the People in Beijing (Jan 2011). Clearly, the 'harmonious world' is here to stay. Not surprisingly, some commentators have noted that 'harmonious world' is not entirely novel, given its similarities and consistency with Mao's 'Five Principles of Peaceful Co-Existence' (Blanchard and Guo 2008, p. 07). Nonetheless, what makes the 'harmonious world' interesting is the suggested new attitude of assertiveness and activism it advocates for China in global interactions, marking a divergence away from Xiaoping's taoguang yanghui (hiding one's capacities whilst biding our time) philosophy (Tok and Zhang 2007, p. 02). But more importantly, Hu's 'harmonious' foreign policy was unique in the sense that it was China's first truly normative declaration of how the world should be ordered (Callahan 2011a, pp. 01-04). Without a doubt, 'harmonious world' is certainly being talked about and taken seriously, and it is impossible to deny the discursive/soft power of the concepts 'harmony' and 'harmonious world' both internationally and domestically. After all, who doesn't want the 'harmony,' 'peace,' and 'mutual co-existence' as is generically stated by the Chinese leadership? For instance, "the largest database of Chinese journals shows an increase in the number of articles featuring 'harmony' in their titles from around 30 in 2003… to 6,600 in 2005" (Delury 2008, p. 05). Internationally, 'harmonious world' has come under the scrutiny of foreign policy analysts in Australia, Japan, the UK and the USA to name only a few (Australian Senate 2006; Reilly 2008; Kwok 2011; Geis and Holt 2011; Men 2008). Nevertheless, even if one has a vague idea of the main framework of how this 'harmonious world' may be officially built, it is still no clearer as to how such a world is being created by China. In other words, how is the 'harmonious world' on paper being translating into action by the Chinese state? One way to assess the extent to which China is building a harmonious world is therefore to empirically study its international actions and practices, and compare their 'fit' with foreign policy rhetoric. This has been one of the central ways in which intellectuals and policy analysts have taken on the task of descrambling Hu's statements. For instance, various academics have examined China's new 'harmonious' diplomacy in relation to a myriad of issue areas, such as energy security (Lheem 2008) and institutional engagement (Suzuki 2008; He 2008). Numerous thinkers have also investigated China's 'harmonious world' vision in relation to other 'powers,' be they national, regional, international or even global. For example, this includes China's engagement with the Global South (Ding 2008); in ensuring a 'Harmonious Asia' (Dongxiao and Hwang 2010); and building harmonious relations with Africa (Jingfu and Zhaoyu 2009); to name a select few areas and authors. These commentators, amongst others, have drawn different conclusions on whether China is building a 'harmonious world,' ranging from the very positive, to the highly sceptical. However, whilst the above is incredibly constructive and essential, this analysis still seems too narrow and simplistic. One must remember that the 'harmonious world' is not only a foreign policy strategy, but also a normative or idealistic world order and vision in China. Some authors have noted the difficulties in trying to pin down a specific meaning to the 'harmonious world' concept, and as a result, "Hu may have unwittingly made himself a hostage to his own policy idea" (Tok and Zhang 2007, p. 09; Callahan 2011b, pp. 263-264). It is therefore insightful to analyse the concept of 'harmonious world' and 'harmony' from within China, in order to take into account the views of intellectuals, academics and wider civil society. Doing so is not an attempt to demonise or pedantically search for practices/ideas that may undermine the party's official discourse and international actions. Instead, it serves to prevent the reification of China itself by opening up and analysing Chinese foreign policy from multiple dimensions. Subsequently, it prevents the naturalisation of concepts/policies officially advocated as the 'real' perspective. Angang, H. (2011) China in 2020: A New Type of Superpower Washington DC: The Brookings Institute. Australian Senate (2006) "China's Emergence: Implications for Australia, report of the Inquiry into Australia's Relations with China by the Senate Committee on Foreign Affairs, Defence and Trade, Parliament of Australia" Available online at: http://www.aph.gov.au/Senate/committee/fadt_ctte/china/index.htm Last Accessed: 07/12/12. Barabantseva, E. (2009) "Change Vs. Order: Shijie Meets Tianxia in China's Interactions with the World" Alternatives: Global, Local, Political 34: pp. 129-155. BBC News (2012a) "Anti-China Protests in Vietnam" Available online at: http://www.bbc.co.uk/news/world-asia-20656533. Last accessed: 08/12/12. BBC News (2012b) "China Confirms Leadership Transition: Xi Jinping Full Text" Available online at: http://www.bbc.co.uk/news/world-asia-china-20338586 Last accessed: 06/12/12. BBC News (2012c) "China Reports Strong Economy Data" Available online at: http://www.bbc.co.uk/news/business-20657311 Last Accessed: 09/12/12. Bergsten, C., Freeman, C., Lardy, N. and Mitchell D. (2009) "China in the World" in Bergsten, C., Freeman, C., Lardy, N. and Mitchell D. (eds) China's Rise: Challenges and Opportunities. Washington: The Peterson Institute for International Economics. Blanchard, J. and Guo, S. (2008) "Introduction: 'Harmonious World' and China's New Foreign Policy" in Blanchard, J. and Guo S. (eds) "Harmonious World" and China's New Foreign Policy Plymouth: Lexington Books. Callahan, W. (2008) "Chinese Visions of World Order: Post-hegemonic or New Hegemony?" International Studies Review 10 (4): pp. 749-761. Callahan, W. (2011a) "Introduction: Tradition, Modernity and Foreign Policy" in China" in Callahan, W. and Barabantseva, E. (eds) China Orders The World: Normative Soft Power and Foreign Policy Washington DC: Woodrow Wilson Press. Callahan, W. (2011b) "Conclusion: World Harmony or Harmonizing the World?" in China" in Callahan, W. and Barabantseva, E. (eds) China Orders The World: Normative Soft Power and Foreign Policy Washington DC: Woodrow Wilson Press. Callahan, W. (2012) "China's Strategic Futures: Debating the Post-American World Order" Asian Survey 52 (4): pp. 617 - 642. Cohen, D. (2012) "Xi Jinping's Chinese Dream" The Diplomat Available online at: http://thediplomat.com/china-power/xi-jinpings-chinese-dream/ Last accessed: 08/12/12. CNN (2009) "China to send 'harmony makers' to Urumqi" Available online at: http://edition.cnn.com/2009/WORLD/asiapcf/09/08/china.urumqi.unrest/index.html Last Accessed: 07/12/12. Dellios, R. (2009) "China's Harmonious World (Hexie Shijie) Policy Perspective: How Confucian Values are Entering International Society" Invited paper presented at the 2560th anniversary conference and the fourth congress of International Confucian Association (ICA): The current mission of Confucianism Beijing: China. Dellios, R. (2012) "What does Harmonious Regionalism mean?" East Asian Security Symposium and Conference Beijing: China. Delury, J. (2008) "'Harmonious' in China" Hoover Institution Policy Review 148. Available online at: http://www.gees.org/documentos/Documen-02891.pdf Last accessed: 02/12/12. Deng, Y. (2006) "Reputation and the Security Dilemma: China reacts to China Threat Theory" in Johnston, A. and Ross, R. (eds) New Directions in the Study of China's Foreign Policy Stanford: Stanford University Press. Ding, S. (2008) "'Harmonious World': China's Soft Power Wielding in the Global South" in Blanchard, J. and Guo S. (eds) "Harmonious World" and China's New Foreign Policy Plymouth: Lexington Books. Du, C. Juffermans, K. and Wang, X. (2012) "Harmony as language policy in China: An Internet Perspective" Kings College London: Urban Language & Literacies 93 Available online at: http://www.kcl.ac.uk/innovation/groups/ldc/publications/workingpapers/the-papers/WP93-Wang-et-al-2012-ii-Harmony-as-language-policy-in-China.pdf Last Accessed: 09/12/12. Feldkircher, M. and Korhonen, I. (2012) "The Rise of China and Its Implications for Emerging Markets" BOFIT Discussion Papers. Available online at: http://www.suomenpankki.fi/bofit/tutkimus/tutkimusjulkaisut/dp/Documents/2012/dp2012.pdf Last accessed: 07/12/12. FlorCruz, J. (2012) "Checkered end-of-term report card for Hu Jintao" CNN Available online at: http://edition.cnn.com/2012/11/08/world/asia/china-hu-jintao-report-card-florcruz/index.html Last accessed: 02/12/12. Fravel, M. (2012) "Foreign Policy Under Xi Jinping" The Diplomat Available online at: http://thediplomat.com/china-power/foreign-policy-under-xi-jinping/ Last Accessed: 09/12/12. Geis, J. and Holt, B. (2011) "Harmonious Society: Rise of the New Boxers" in Caine, S., Donaldson, E., Geis, J., Holt, B. and Sandfry, R. (eds) Discord or Harmonious Society? : China in 2030. Maxwell Airforce Base: Center for Strategy and Technology. He, K. (2008) "China's Peaceful Rise and Multilateral Institutions: In search of a Harmonious World" in Blanchard, J. and Guo S. (eds) "Harmonious World" and China's New Foreign Policy Plymouth: Lexington Books. Hughes, C. (2012) "In Case You Missed It: China Dream" The China Beat Available online at: http://www.thechinabeat.org/?p=1814 Last Accessed: 07/12/12. Jingfu, Z. and Zhaoyu, H. (2009) "China's Relations with Africa: Building a Harmonious World" Contemporary International Relations 19 (1). Jintao, H. (2005) "Build Towards a Harmonious World of Lasting Peace and Common Prosperity, Statement by Hu Jintao at the United Nation's 60th Summit" Available online at: http://www.un.org/webcast/summit2005/statements15/china050915eng.pdf Last accessed: 04/12/12. Jintao, H. (2007). "Report at 17th Party Congress" Available online at: http://news.xinhuanet.com/english/2007-10/24/content_6938749.htm Last Accessed: 07/12/12. Kristensen, P. and Neilsen, R. (2010) "Writing on the Wall: Prominence, Promotion and Power Politics in the Quest for a Chinese International Relations Theory" Masters Thesis: University of Copenhagen. Kuhn, A. (2010) "In Changing China, Being 'Suicided' or 'Harmonized.' Available online at: http://www.npr.org/templates/text/s.php?sId=124913011&m=1. Last Accessed: 08/12/12. Kwok, O. (2011) "China's Foreign Policy: Harmonious World. Is it a Mere Stratagem, or an Abiding Policy the World Can Trust?" Seaford House Paper: UK Ministry of Defence. Available online at: http://www.mod.uk/NR/rdonlyres/DF8E89C7-013C-4C83-808E-47F1EAD0892E/0/SHP11Kwok.pdf Last accessed: 05/12/12. Lheem, H. (2008) "China's Energy Security and Its Strategic Implications" in Blanchard, J. and Guo S. (eds) "Harmonious World" and China's New Foreign Policy Plymouth: Lexington Books. Li, C. (2007) "China's Leadership, Fifth Generation" The Brookings Institute Available online at: http://www.brookings.edu/research/articles/2007/12/china-li Last accessed: 07/07/12. Li, R. (2012) "Six Politburo Standing Committee Members are not Technocrats" South China Morning Post Available online at: http://www.scmp.com/news/china/article/1086358/six-politburo-standing-committee-members-are-not-technocrats Last Accessed: 08/12/12. Lui (2012) "Xi Pledges 'great renewal of Chinese nation'" Xinhua Available online at: http://news.xinhuanet.com/english/china/2012-11/29/c_132008231.htm Last Accessed: 09/12/12. Men, J (2008) "China's Rise and its Relations with Other Major Powers: Competitors or Partners?" in Blanchard, J. and Guo S. (eds) "Harmonious World" and China's New Foreign Policy Plymouth: Lexington Books. Mingfu, L. (2010) China Dream: The Great Power Thinking and Strategic Positioning of China in the Post-American Age. Beijing: Zhongguo youyi chuban gongsi. Nordin, A. (2011) "Internet Censorship and its Responses: Possibilities and Dangers in China" paper presented at 'Political Regimes, Growth Politics and Conflict in Asia: Responses to changing environmental, economic and socio-cultural conditions' Stockholm University. Nordin, A. (2012) "How do China's Leading Thinkers View the Rest of The World?" lecture presented at Manchester: Manchester Museum. Pan, Z. (2008) "China's Changing Image of and Engagement in World Order" in Blanchard, J. and Guo S. (eds) "Harmonious World" and China's New Foreign Policy Plymouth: Lexington Books. People's Daily Online English (2010) "Senior Colonel: China should displace U.S. to be strongest country militarily" Available online at: http://english.peopledaily.com.cn/90001/90776/90786/6906179.html Last Accessed: 07/12/12. Politics and Policy (2012) "China's Looming Transition" Available online at: http://politicsandpolicy.org/article/chinas-looming-transition Last Accessed: 09/12/12. Reilly, J. (2008) "Harmonious World and Public Opinion in China's Japan Policy" in Blanchard, J. and Guo S. (eds) "Harmonious World" and China's New Foreign Policy Plymouth: Lexington Books. Reuters (2012) "Xi Jinping sets new rules for China" NDTV Available online at: http://www.ndtv.com/article/world/xi-jinping-sets-new-rules-for-china-301059 Last accessed: 06/12/12. Rigby, R (2010) "The Challenge of China" East Asian Forum Quarterly Available online at: http://www.eastasiaforum.org/2010/02/07/the-challenge-of-china/ Last Accessed: 05/12/12. South China Morning Post (2012a) "China Leads Rise in Asia Military Spending" Available online at: http://www.scmp.com/news/china/article/1062234/china-leads-rise-asia-military-spending Last Accessed: 07/07/12. Suzuki, S. (2008) "Seeking 'Legitimate' Great Power Status in Post-Cold War International Society: China and Japan's Participation in UNPKO" International Relations 22 (1): pp. 45-63. Tingyang, Z. (2006) "Rethinking Empire from a Chinese Concept 'All-Under-Heaven' (Tianxia)" Social Identities 12 (1): pp. 29 - 41. Tobin, D. (2012) "Dr. David Tobin from the University of Manchester talks to BBC Radio Scotland" Soundcloud Available online at: https://soundcloud.com/inqualitymedia/dr-david-tobin-from-university Last accessed: 08/12/12. Tok, S. and Zheng, Y. (2007) "'Harmonious Society' and 'Harmonious World': China's Policy Discourse Under Hu Jintao" China Policy Institute: University of Nottingham. Available online at: http://nottingham.ac.uk/cpi/documents/briefings/briefing-26-harmonious-society-and-harmonious-world.pdf Last accessed: 01/12/12. Xiaoying, Q. (2006) "Harmonious society to be a model for the world" China Daily Available online at: http://www.chinadaily.com.cn/opinion/2006-10/13/content_707289.htm. Last accessed: 03/12/12. Yu, V. (2012) "Xi Jinping Lavishes Praise on Hu Jintao for his Clear Direction" South China Morning Post Available online at: http://www.scmp.com/news/china/article/1079037/xi-jinping-lavishes-praise-hu-jintao-his-clear-direction Last accessed: 07/12/12. 1.) See for instance, Deng Y. (2006) "Reputation and the Security Dilemma: China Reacts to China Threat Theory." 2.) A not too dissimilar argument is noted by Yan Xuetong, and is quoted within Hu Angang's book "China in 2020: A New Type of Superpower"; although in relation to the 'peaceful rise' principle (Xuetong cited in Angang 2011, p. xxxviii). 3.) See Dellios (2012) "What does Harmonious Regionalism Mean? "; for greater insights into the recent Senkaku/Diaoyu islands incidents in relation to the Chinese 'harmonious' S-E Asian strategy. Richard E. Poole graduated in 2012 with a Bachelors degree in Politics and International Relations from University of Manchester in Manchester, United Kingdom.